Discussion in 'Tour archive (read-only)' started by davidt, Feb 17, 2018. Morrissey review – aloof, obnoxious and proudly provocative by Graeme Virtue (3 of 5 stars, 1 photo by Wattie Cheung) - The Guardian. Link posted by PassportToPimlico. FAN RAGE - Morrissey fans storm out of Hydro after the singer blasts First Minister Nicola Sturgeon by Chris Sweeney (1 photo by Wattie Cheung) - The Scottish Sun. Link posted by an anonymous person. Morrissey fans walk out of Glasgow show after singer insults Nicola Sturgeon - NME. Link posted by an anonymous person. Review: Morrissey, SSE Hydro, Glasgow by Mark Smith (4 stars) - The Herald. Link posted by samharry. Music review: Morrissey, SSE Hydro, Glasgow by Paul Whitelaw - The Scotsman. Link posted by Famous when dead. Morrissey jibe at Nicola Sturgeon sparks walk-out at Scottish gig by Craig Forbes - The Scotsman. Link posted by Maradona. Morrissey concert jibe at Sturgeon fires backlash - The National. Link posted by Halloway. MORRISSEY – SSE HYDRO GLASGOW 17/2/18 - The M.M.A. Link posted by mountjoy. Live Review: Morrissey @ The SSE Hydro, Glasgow by Kirsten Robertson (3 of 5) - Brig Newspaper. Link posted by Famous when dead. Did Hugh manage to sneak in? hugh is currently tunnelling from his house to right under the hydro stage,he can take in the show from the stages trap door. that is a big venue as well so mozz hasn't lost any of his appeal and for me is actually making new fans,i think SPENT has a lot to do with it as it was so catchy. Love reading people’s stories on these pre gig forum discussions, this time next week I will be eagerly waiting in Leeds to finally see Morrissey, a moment I have waited so so long for, cannot wait!! enjoy it,first mozz concert will always be special,piece of advice, don't get too pissed because the next day you wont remember a thing. Due on stage 9:05-9:10 again. All credit to those sharing. Does anybody know the song at the start of the video, great footage btw, cannot wait for Leeds next week!! Start of Dickie's video is, I believe, The Four Tops: It's The Same Old Song. Followed by Jet Boy - NYD. that list is like the united nations,wonder what happened to maja who only stayed for ten minutes. What the hell is a queue list?!!!! 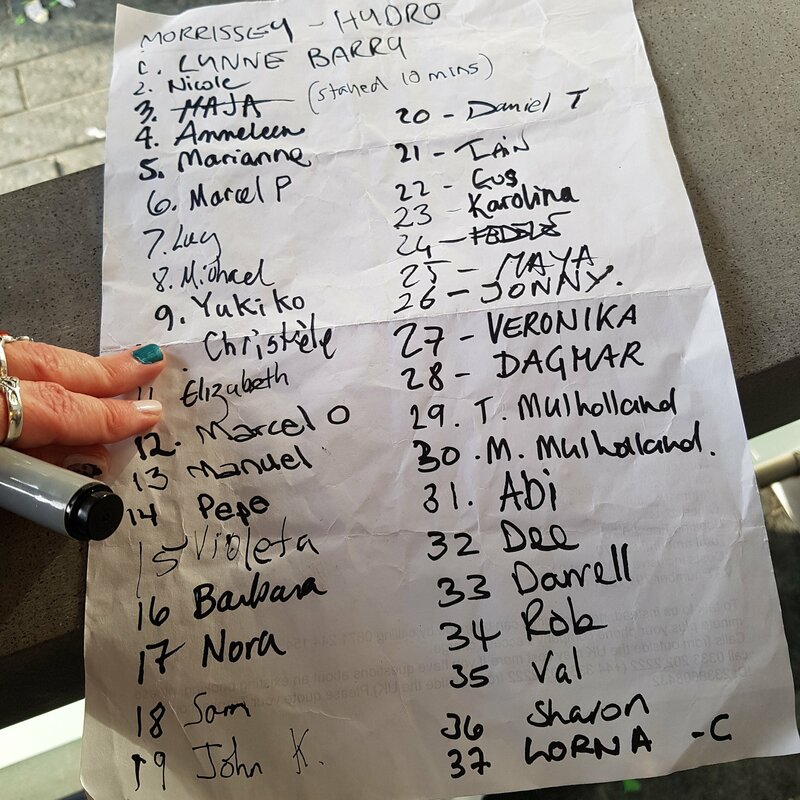 A list generated by 'security' or event staff that acknowledges people who are at the front of the queue / turned up very early to the gig who are assured, by being placed on the list, a front row experience. There is a lot of history relating to this process - feel free to search the archive here. I hope that was the beginning of an actual performance of "In Your Lap" at the end, and not just the piano intro usually played for another song.